OK I didn’t actually do “the deed” myself, my Mom did. My Mom gets all the credit for the husbandry too, given that I live in Toronto and keeping chickens is [ridiculously] illegal. 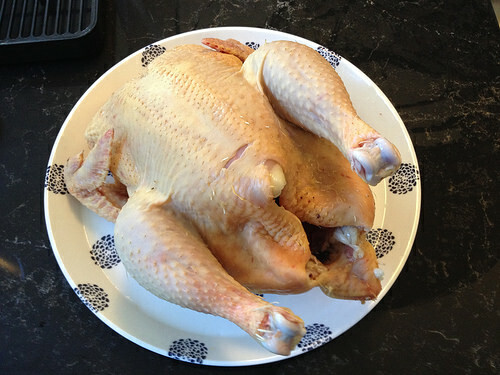 But I did pluck, eviscerate and prep this bird for the freezer, along with about 40 others. I grew up on a hog farm, where we raised pigs from farrow (birth) to finish (market weight). In addition to the business end of the farm we kept our horses and a plethora of other hobby animals, usually Muscovy ducks, turkeys, goats and of course always chickens, both for eggs and meat. We even had a Jersey calf one year. Not every spring but definitely often, my Mom would order chicks to be raised for meat, and at some point in the summer we would pull together family members to help with the butchering process. Everyone got to take home some birds for contributing to the group effort. I always got the plucking job, which I kind of hated as a kid (I think you hate all chores when you’re a kid). While we haven’t raised meat chickens in a very long time, Chris and I were keen to take advantage of the farm access and have some really good quality meat this year. We started with big aspirations to build a roving chicken tractor, as we’ve got a bit of a problem with an ambitious fox at the farm, but that plan kind of flopped (we are after all working professionals and the farm is a good two hours drive from home). Instead, my Mom set up the chicks in the horse barn, and when they got big enough she started letting them venture on out into the horse pasture. Chickens are brilliant in that the come inside to roost at night, so it’s easy to ensure the fox can’t pillage under cover of darkness, when the birds are easy pickings. We just had to hope that they didn’t get grabbed up by hawks while they ventured out to eat bugs and grass. In late July my Mom butchered a half dozen or so birds on her own, and most of them were dressing out at about 4 lbs, a nearly ideal weight for a meal or two for a couple people. So we set a date for butchering, Mom coordinated a few local friends and family and we got down to work. It had been quite a few years since I had butchered chickens, and I had only been allowed to help with evisceration once as I recall, with my Grama, so I found a few videos that were helpful in reminding me how to go about it, which I’ve included at the end of this post. I fully accept that some readers may find this post and/or the videos entirely offensive. However, if you’re a meat eater, you might as well know a.) where your food comes from and b.) what goes into preparing it. I make no apologies for sharing this material; watch it or don’t — it’s your choice. I for one feel privileged that I have the knowledge to be self sufficient in preparing my own food, fresh from the field, and I know that the animals we raised and killed lived a happy life eating bugs and doing their own thing in the open air and sunshine. I also know that I treat this food with great respect because I know exactly how much work and care went into getting it onto my plate. I don’t waste it; I use every bit. Most of the birds we butchered as a group dressed out at 5 to 6 lbs, and I have about 15 or so birds to keep us going over for many months. The meat and fat quality is out of this world; there hasn’t been any brine injected, and they haven’t been chlorine washed or water logged to make them artificially heavier for sale at the grocery store. Roasting this bird is very simple. 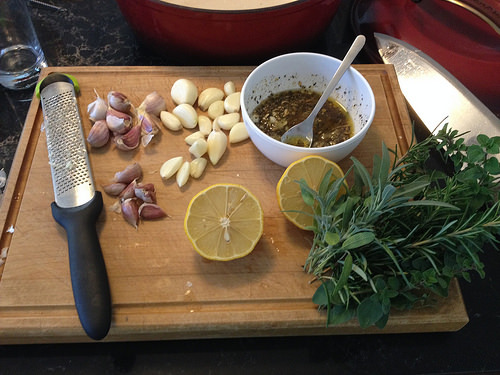 I stuffed some fresh herbs from my garden inside (rosemary, sage, some oregano), along with a halved lemon that’s been partially squeezed inside and around the bird, and a bunch of peeled whole garlic cloves. Placing the bird n a Dutch, I brushed the skin with a mixture of olive oil, minced garlic, various dried herbs and salt and pepper. Around the bird I placed more whole cloves of garlic (some not even peeled because I got a bit lazy — there were about 30 cloves of garlic in this dish), and put the remaining whole herbs around it. Everything is brushed with oil and then popped into a slow oven (about 325ºF) for a couple of hours. 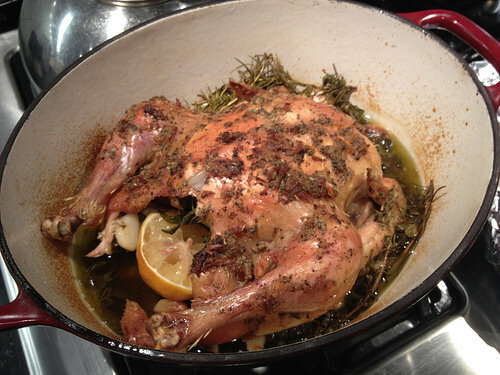 How long you roast for is dependant on the size of the bird; you need the breast to reach 165ºF. 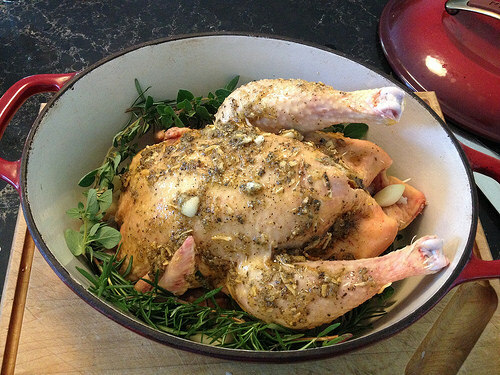 Most recipes recommend you start the oven off high (450ºF) for 10 to 15 minutes and then roast the bird at 350ºF for 20 minutes per pound. I find using a Dutch oven gives me that rich caramelized skin without having to bother with the fast and slow oven method, and I can leave the lid on the pot to keep everything beautifully moist. I stick it in the oven and forget it for a couple hours — it’s the easiest way to roast a chicken ever. Once I’ve picked the carcass clean I put all the bones and uneaten skin into a bag and freeze it. Once I have 3 or 4 carcasses I will turn them into stock, which I then pressure can for soups and stews. I used to just freeze my stock but the freezing process routinely breaks plastic containers and pressure canning allows me to save on freezer space. Next up, I’ll post about the tastiest and easiest way to roast a squash — a perfect side accompaniment for this chicken that can roast along with the bird to make this your laziest but possibly most impressive Sunday meal ever.